HollyHole invites you to enjoy the adventures of the 9 holes miniature golf based on classic Hollywood movies where women's sexuality explodes and challenges the player. The precedents of the first patented mini golf in the early 20th century by Garnet Carter are located in Europe, specifically in Scotland. In Victorian times women’s participation in recreational games was limited to croquet, badminton and archery, but the access to the golf course was restricted. Due to several attempts by many women to access to the course, a 9-holes miniature course was designed for them. 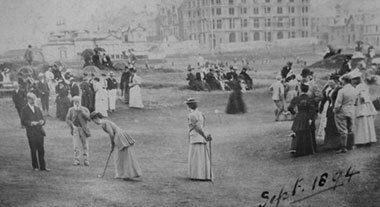 So St Andrews Ladies’ Golf Club, later known as St Andrews Ladies’ Putting Club, was formed in 1867. 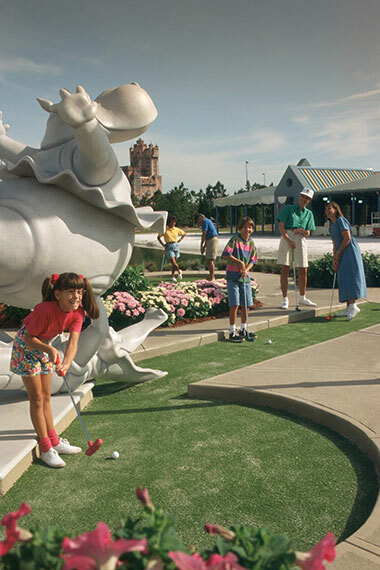 The mini golf has evolved into a thematic form, that is why it is a must for any theme park. Becoming a peculiar combination of an amusement park and a miniature world, these areas are an ideal environment to zap around the most famous monuments of the world, through a movie set, etc. Throughout the game the visitor behaves like a viewer, as an operator capable of connecting cultural and imaginary scenarios. Golf has become an excuse to be part of this network of thematic scenarios. In the same way that women’s golf practice was banned designing for them a distorted golf course, the mainstream cinema —specifically the Hollywood films— make a representation of those women who do not conform to the norm equally distorted. Female characters are represented as the crazy, the murderer, the suicidal... These characters and scenarios are perfect for designing our own 9 holes mini golf course. We have made a selection of 9 films throughout the history of Hollywood and represented them in 9 holes, which are named after the female character of each film. Overall we found: Hole 1_Ms Danvers, Hole 2_Martha, Hole 3_ Mircalla, Hole 4_Thelma and Louise, Hole 5_Catherine, Hole 6_Pauline and Juliet, Hole 7_Violet and Corky, Hole 8_Kelly and Suzie and finally Hole 9_Chloe.